The Prime Minister of Vanuatu, Moana Carcasses called for international action on West Papua at the United Nations Human Rights Council in Geneva today. Following on from his speech at the UN last September, Mr Carcasses focused his speech on the “chronic human rights challenges that has affected the … peoples of West Papua since 1969”. 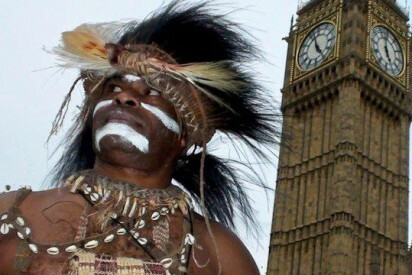 In support of Mr Carcasses speech people took part in peaceful demonstrations across West Papua. Despite intimidation from police the demonstrations went ahead successfully. More information and images from the demonstrations can be seen here. The Republic of Vanuatu is very pleased to be addressing this meeting today. 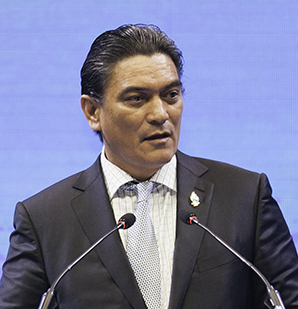 I have come here to join the leaders of the world to discuss and raise concerns on different human rights challenges affecting millions of innocent citizens across the entire globe, from the island countries and in countries across continents. Mr. President, the focus of my statement here today will be on two important but very highly critical issues to the entire population of my country. First I want to focus on the rights of our indigenous people to practice their cultural and spiritual rituals in the two of our islands in the Tafea Province, South of Vanuatu. And Secondly, I will bring to the forefront or our debate some of the issues regarding human rights abuses in West Papua that have been very disturbing to the community of democracies around the world. Mr. President, my country’s struggle to achieve political independence in 1980 was marked with incidences of social protests and emergence of some political movements within our country. We were Melanesians being governed by Britain and France in our own mother land. Prior to 1980, we were stateless in our country and we were neither French of British citizens. And for almost 4 decades, we were exposed to foreign rule. So we had to struggle to construct our identity as free people to live in dignity. Independence was our objective. And this was a compelling thrive that motivated our leaders to achieve nothing less than political independence. We did not fight for independence because we were economically and financially ready. We did not fight for independence because our colonial masters were killing our people. No. We fought for our political independence because it is our God given right to be free. Freedom was our inalienable right. It is a human right. And Vanuatu was proclaimed independent on 30 July 1980. Thirty three years after our independence I am delighted to say that France has begun to demonstrate its willingness four our indigenous people to visit two of our very sacred islands, Umaepnune (Mathew) and Leka (Hunter) in the southern part of our country to fulfill their cultural and spiritual obligations. Rituals and ceremonies have continued to be held on other islands of the Tafea province annually despite the blockage previously imposed by the French authority for our tribesmen to travel to the sacred islands Umaepnune and Leka islands to fulfill their cultural and spiritual duties. Mr. President, I want to now focus my attention on the chronic human rights challenges that has affected the indigenous Melanesian peoples of West Papua since 1969. And I do this with great respect and humility. My country is here in this meeting to amplify the concerns for human rights in West Papua. We are very concerned indeed about the manner in which the international community had neglected the voices of the Papuan people, who’s human rights have been trampled upon and severely suppressed since 1969. Mr. President, you are presiding over the noblest organ of the United Nations- the Human Rights Council. But what do we do when rights of the Melanesian people of West Papua is challenged with military interventions and presence? Since the controversial Act of Free Choice in 1969, the Melanesian People of West Papua have been subject to on-going human rights violations committed by the Indonesian security services. The world has witnessed the litany of tortures, murders, exploitation, rapes, military raids, arbitrary arrests and dividing of civil society trough intelligence operations. The Indonesian National Commission on Human Rights (KOMNAS HAM) concluded that these acts constitute crimes against humanity under Indonesian Law No. 26/2000 (KOMNAS HAM 2001,2004). In this climate of fear and repression of political dissent, and blatant negligence by the international Community including the UN and the powerful developed countries since 1969, we find this forgotten race still dare to dream for equality and justice. Yet the democratic nations have kept silent. Mr. President, as a Melanesian citizen, I have come here to call for immediate action. Injustice in West Papua is a threat to the principle of justice everywhere in the world. I do not sleep well at night when I know that in 2010 Yawan Wayeni, known as a separatist was videotaped by the security forces as he was lying in a pool of his own blood with his intestines seeping from a gaping wound in his abdomen. It concerns me that in October 2010 Telenga Gire and Anggen Pugu Kiwo were tied by the military and were severely tortured. It concerns me when I see the video footage of a group of Papuan men bounded and being kicked in the head by uniformed soldiers who are meant to protect them. I am worried because between October of 2011 and March 2013, 25 Papuans were murdered and nothing has been done to bring perpetrators to justice. And it embarrasses me. As a Melanesian, to note that roughly 10 % of the indigenous Melanesian population have been killed by the Indonesian Security forces since 1963. While I acknowledge the 15 years of reformation that has taken place, I am also worried that Melanesians will soon become a minority in their own motherland of Papua. Mr. President, in a world so now closely connected with innovative technology, there should be no excuses about lack of information on human rights violations that have plagued the Papuan people for more than 45 years. Search the internet and research papers by academic institutions and international NGO’s and you will find raw facts portraying the brutal abuse of the rights of the Melanesian people in Papua. But why are we not discussing it in this counsel? Why are we turning a blind eye to them and closing our ears to the lone voices of the Papuan people, many of whom have shed innocent blood because they want justice and freedom. Many are martyrs that have been persecuted and brutally murdered because the carry the unspoken voices of the millions now living in fear in the valleys and lofty mountains of Papua. They are demanding recognition and equality and a respect for their human rights and to live in peace. Will this august council hear their cries and now go forward to protect their human rights and put right all wrong of the past? I have listened attentively to the voice of a former Civil Servant Mr. Filep Karma and student Yusak Pakage who were sentenced to 15 and 10 years in prison and speaking from behind bars, calling on our countries in the Pacific to speak out against the injustice against them. These are the children of the warriors who have stood firm to fight during the second world war in the Pacific and who helped bring peace and security in our part of the world. It is now our duty to bring peace to their tribal villages and communities by affording them their basic human rights that most of us here take for granted. I am very encouraged that the matter has now reached the European Union Committee on Human Rights and we look forward for some actions to improve the human rights conditions of our brothers and sisters in Papua. I further call on the Governments of the developed countries including the African nations and the island countries of the Caribbean and the Pacific to condemn the issue of human rights violations. I want to echo the words of Martin Luther King Jr., who said in his speech in 1963 that, “nothing in the world is more dangerous than sincere ignorance and conscientious stupidity.” We the democratic nations must not ignore the cries of the Papuan people. Mr. President, the concerns we are raising here is more than a question of keeping 70 % of the wealth from oil and gas in West Papua, it is the question of political status. The concerns we are raising here, is more than the question of economic status were 80 % of wealth from Forestry, Fisheries and general mining are kept in Papua. It is a question of the respect of the human rights and existence of the Melanesian people. Our concern is not to see how much they have been fed by a golden spoon, but to see the measure of respect for freedom accorded to the Papuans as equal citizens. And to what degree the civil society are given the right to express concerns about the quality of governance in their motherland. For this should be a measure of a vibrant democracy. Mr. President, access must be allowed for the UN human rights monitor, international journalists and international human rights NGO’s to visit West Papua. It is clear from many historical records that the Melanesian people of West Papua were the scapegoat of Cold war politics and were sacrificed to gratify the appetite for the natural resources which this country possess. Mr. President, if the UN Representative, Mr. Ortiz Sanz had described the West Papuan issue as a cancer growing “on the side of the and that his job was to remove it”, it is very clear today from what we have seen that this cancer was never removed but simply concealed. One day, this cancer will be diagnosed. We must not be afraid if the UN had made some mistakes in the past. We must admit our mistakes and correct them. Mr. President, as I close, my government believes that human rights challenges of Papua must be brought back to the agenda of the United Nations. I call on the Human rights Council to consider adopting a resolution to establish a country mandate on the situation of human rights in West Papua. The mandate should include investigation of the alleged human rights violation in West Papua and provide recommendations on a peaceful political solution in West Papua. This will help to assist in supporting H.E. President Yudhoyono’s pledge to hold dialogue with Papua. Thank you once again for the opportunity to express my views in this forum. Long God Yumi Stanap. In God we Stand. Thank you.